Not quite four years after George W. Bush stood in front of a "Mission Accomplished" banner onboard the U.S.S. Abraham Lincoln declared the Iraq War a success was a new strategy for dealing with the insurgency announced. On January 10, 2007, Bush announced that 20,000 additional soldiers would be sent to Iraq – mostly to Baghdad – while another 4,000 Marines found their tour of duty in Anbar Province extended. The move provoked an immediate reaction from al-Qaida in Iraq, the Sadr Army and other elements unhappy with the continued American presence. That reaction included increased ambushes, improved explosive devices and attacks on military targets. Among the soldiers taking the brunt of the attacks were the members of U.S. Army Ranger 2-16 Infantry Battalion, sent to Baghdad for a 15 month deployment. Joining them was Washington Post correspondent David Finkel, who chronicled their tour in The Good Soldiers, a harrowing account of the chaos, attacks and their personal sacrifice. Finkel takes the reader along with the soldiers as they brave city streets where every garbage pile, abandoned vehicle or ditch contained a flesh shredding bomb and every rooftop and alley way seemed to be haunted by a RPG or assault rifle wielding enemy. Early confidence eventually gave way to a weary bitterness. Among the central figures in Finkel's account is Col. Ralph Kauzlarich, a man of boundless optimism with a personal motto of "It's all good." Along with a large bag of soccer balls for Iraqi children, Kauzlarich has a plan to engage the citizens to earn their trust and bring the fight to the enemy as fiercely as possible. And for a few weeks it seems to work as the 2-16 attempts to send a message to the insurgency by brazenly patrolling the most dangerous areas of their responsibility. They establish a few smaller bases in the area to monitor the situation and gather evidence and seem to connect with the locals. The situation quickly changes, however, when the hornet's nest that the surge upset begins attacking the 2-16's patrols with powerful IEDs and RPGs. The Humvees the soldiers use offer little protection and the causalities begin to mount. The battalion's soldiers begin to suffer grievous wounds which include severe brain damage, limbs being torn away and massive shock thanks to the seemingly ubiquitous bombs. Inevitably the first fatalities are registered and the early gung-ho attitudes of the soldiers gradually give way to the realization that the war is far from over and it will be their jobs to quell the violence. As anyone who has served in the military can tell you, it is the right of every grunt to complain about their lot and the soldiers of the 2-16 are no different. Several quietly debate the usefulness of their presence and Kauzlarich's unfailing positive attitude earns him the sobriquet of "Lost Kauz" from some to outright hostility from others recovering from their wounds back home. Despite that, the unit remains committed to their mission and despite all setbacks continue to fight for some kind of peace. Progress is measured in an Iraqi smile, a whispered bit of intelligence and a day that sees no casualties. 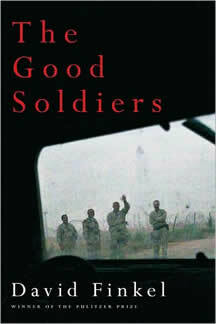 The Good Soldiers is a searing piece of reportage that can be difficult at times to read. The story that Finkel tells is of men suffering both physically and mentally in an unforgiving battle zone and the toll it took on their families. Just as with Rick Atkinson's masterpiece In the Company of Soldiers: A Chronicle of Combat in Iraq or Evan Wright's Generation Kill: Devil Dogs, Iceman, Captain America, and the New Face of American War, Finkel thrusts the reader into the Humvee alongside the soldiers and effectively unfolds a story that both tires and inspires, often for the same reasons. There is one considerable failing with The Good Soldiers and it is that Finkel actually concentrated too much on the action on the ground and ignored the wider picture. Although some of the soldiers became increasingly discontented with their mission, the end result is that the surge did quell the worst of the violence. And although Finkel attempts the neat trick of editorializing without doing so by contrasting the increasingly optimistic Bush quotes he picked to headline each chapter with the horrible violence the soldiers are experiencing, Finkel never illustrates the other actions taken that made the mission a success. It's difficult to square Finkel's reportage on the ground with the reality of what actually happened on the strategic level. It's a weakness but not a fatal one. At the end of the day we know Bush's surge actually was successful and that leaves us to concentrate on the individual soldiers and their stories. The surge's success came at considerable expense when measured in lives and limbs and although it can be unbearable at times to read as soldiers are shredded by IEDs and RPG fire, we can thank Finkel for chronicling the exceptional bravery and determination of the men on the ground. Regardless of where one stands on the war in Iraq, The Good Soldiers is a testament to those who served their nation and refused to fail.